Much of the public discussion about the Affordable Care Act(ACA)has focused on the expansion of coverage to the uninsured through subsidies to individuals and the expansion of Medicaid. The law will also result in changes for some of the 156 million Americans who are covered through an employer-sponsored plan.1 This summary addresses common questions from unions and employers about the law’s impact on employer-sponsored insurance. This summary reflects our interpretation of the ACA statute and regulations that have been released to-date by the Department of Treasury, Department of Health and Human Services, and Department of Labor. The law created new health insurance marketplaces that offer a choice of plans that meet standards for coverage and that provide information to consumers and small employers to help them make educated choices about the policies they are purchasing. Small employers can participate in the Marketplaces. States have the option to define small employers as up to 50 or 100 employees through 2015, and must define small employers as up to 100 employees beginning in 2016. States can choose to expand Marketplaces to larger businesses beginning in 2017. Citizens and legal immigrants may purchase coverage through the Marketplaces. The coverage will be subsidized for individuals in families within come not exceeding 400 percent of the Federal Poverty Level($46,000 for an individual and $94,200 for a family of four for plan year 2014) who are not eligible for Medicare, Medicaid, the Children’s Health Insurance Program, or affordable employer-sponsored insurance. For purposes of determining eligibility for subsidies through the Markplaces, affordable employer-sponsored insurance is defined as requiring an employee contribution of less than 9.5 percent of household income for an employee-only plan that covers at least 60 percent of medical costs on average (“minimumvalue”). If self-only coverage costs less than 9.5 percent of household income and the employer offers family coverage(atanycost),then both employees and their family members are ineligible for subsidies regardless of whether or not family coverage is affordable. Employers of all sizes may also continue to purchase coverage outside of the Marketplaces. Overview of free-rider policy: Employers are not required to provide coverage to any employee or dependent, but large employers with at least one full-time employee enrolling in subsidized cover-age in the Marketplaces are subject to a penalty, beginning in 2015. Applicable large employers not offering coverage or offering coverage to fewer than 95 percent of its full-time employees pay $2,000 multiplied by the total number of full-time employees minus 30. This penalty only applies if at least one full-time employee receives subsidies in the Marketplaces. The $2,000 penalty also applies to employers that do not offer coverage to the children (under age 26) of full-time employees, regardless of whether or not the coverage offered to children is affordable. Applicable large employers offering coverage to at least 95 percent of its full-time employees pay the lesser of $3,000 multiplied by the number of full-time employees receiving subsidies, and $2,000 multiplied by the total number of full-time employees minus 30. This penalty may occur because employers did not offer coverage to a full-time employee or because the coverage offered was unaffordable or did not provide minimum value. Applicable large employers are those with at least 50 full-time equivalent employees. If a workforce exceeds this threshold for 120 days or fewer during a calendar year and the employees in excess of 50 are seasonal workers, that employer is not considered an applicable large employer. In this context, a “seasonal worker” is someone who performs labor or services on a seasonal basis, including retail workers exclusively employed during holiday seasons. Applicable large employers include for-profit, non-profit, and government organizations. Affiliated members of a controlled group of large employers are treated as a single employer for purposes of determining large employer status, but as separate employers for assessing penalties. The IRS is still determining the circumstances under which related public employers will be treated as a single employer. Employers with between 50 and 99 full-time equivalent employees will generally be exempt from any penalties in 2015, unless they eliminate or materially reduce health coverage in 2014 or 2015 or reduce the size of their workforce in 2014 in an attempt to qualify for the transition rule. Solely in 2015, the $2,000 penalty will only apply to employers with at least 100 full-time equivalent employees if they do not offer coverage or offer health coverage to fewer than 70 percent of full-time employees. Employers will not be subject to penalties in 2015 on the basis of not offering coverage to dependents if they take steps toward offering dependent coverage during the 2014 and/or 2015 plan years after not offering coverage in both the 2013 and 2014 plan years. Employers can count employees’ hours each month. Employers also have the option of using measurement/ “look-back” and stability periods of 3 to 12 months in length. Employers also have the option to use a 90-day administrative period between the measurement and stability period, but the measurement period and administrative period combined must be less than 14 months. Ongoing employees determined to be full-time in a measurement period are treated as full-time during the subsequent stability period. Employers will be subject to penalties for new non-seasonal employees who are reasonably expected to be full-time as of their start date, if they do not offer coverage by the end of the employee’s initial three full calendar months of employment. Employers are not subject to penalties for new “variable hour” employees or seasonal employees during the initial measurement period. In this context, “seasonal employees” are those hired into a position for which the customary annual employment is six months or less. For employers using the monthly counting method, a “new employee” is one who has never been employed by that employer or has had a break in service. For employers using the measurement period method, a “new employee” is one who has been employed for less than one complete standard measurement period, including rehired employees who have had a break in service. In both cases, a rehired employee is treated as a new employee if the break in service lasts at least 13 weeks (26 weeks for employees of educational organizations). An employee is “variable hour” if, based on the facts and circumstances at the employee’s start date, his/her employer cannot determine whether he/she is reasonably expected to work full-time. Relevant factors include but are not limited to: whether the employee is replacing a variable hour employee or full-time employee; the extent to which the hours of service of employees in similar positions have actually varied above and below 30 hours during recent measurement periods; and how the hours of the job were advertised, communicated to the new employee or documented through a contract or job description. Employers may not take into account the likelihood of the employee leaving the job before the end of the initial measurement period. Additional factors are outlined in regulations for employees of temporary staffing firms. The final regulations outline special rules for determining hours of service for educational employees, adjunct faculty, airline employees, and other unique employee categories. Affordability safe harbors: Employers have the option of using three affordability safe harbors to ensure that they will not owe the $3,000 penalty. The use of these safe harbors does not affect employees’ eligibility for subsidized coverage in the Marketplaces. Employers will not be subject to a penalty if employees’ cost of coverage for the lowest cost employee-only plan with minimum value does not exceed 9.5 percent of the employee’s W-2 income. A second safe harbor compares the cost of the plan to an hourly employee’s rate of pay multiplied by 130 hours or a non-hourly employee’s monthly salary. A third safe harbor is based on the federal poverty level for a single individual. Multiemployer plan transition rule: Until any new guidance is released on this topic, employers will not owe a penalty if, pursuant to a collective bargaining agreement, they contribute to a multiemployer plan that offers affordable coverage with minimum value to their full-time employees and their children. Automatic enrollment: Employers with more than 200 full-time employees must automatically enroll employees into a plan unless they opt out of coverage. This provision will be not be effective until final regulations are issued. How long a waiting period is permissible before an employee is eligible for health coverage? Group health plans and issuers offering group health insurance must limit waiting periods for coverage to no more than 90 calendar days (including weekends and holidays) effective in 2014. This requirement applies to all plans, including grandfathered plans and self-insured plans, and to all types of coverage offered, whether employee-only or family. This requirement prevents otherwise eligible employees (or dependents), including part-time employees who are offered coverage, from being required to wait more than 90 days before coverage becomes effective. Eligibility conditions may not be based solely on the lapse of a time period of more than 90 days, but substantive eligibility conditions are allowed. Examples of allowable conditions include being in an eligible job classification, achieving job-related licensure requirements, or satisfying a reasonable and bona fide employment-based orientation period of no longer than one calendar month. For new variable hour employees, coverage must begin less than 14 months from the employee’s start date. Cumulative hours-of-service requirements are allowed if they do not exceed 1,200 hours. The 90-day waiting period may begin after the hours-of-service requirement is completed. Hours-ofservice requirements must be one-time only and not applied to the same individual each year. Collectively bargained multiemployer plans with eligibility conditions based on working hours across multiple contributing employers are permitted if they are not designed to avoid compliance with the waiting period limitation. Employers that offer coverage will not be subject to penalties during the first three months after employee’s date of hire. The law establishes new standards for employer-sponsored plans, but plans in existence as of March 23, 2010 are grandfathered with regard to many of the standards for current employees, their family members and new employees, as noted in Table 1. Certain changes to plan design will nullify a plan’s grandfathered status, such as elimination of benefits for certain conditions; any increase in coinsurance percentage; an increase in deductible or out-of-pocket limit by more than 15 percent plus medical inflation; an increase in co-payment by more than $5 adjusted for medical inflation or 15 percent plus medical inflation, whichever is greater; an increase in employee share of premium by more than 5 percentage points; or certain increases in a plan’s annual benefits limit. These limits are applied on a cumulative basis, not an annual basis. Changes to premiums, changes made to comply with federal or state laws, or a change of third party administrator will not cause a plan to lose its grandfathered status. Employers that change insurers can maintain grandfathered status as long as the new plan has cost sharing and benefits that are similar to the original plan. Fully-insured plans pursuant to a collective bargaining agreement (CBA) are grandfathered until the last expiration date of a CBA related to that coverage. Grandfathered status may be maintained upon the CBA expiration date if no changes were made since March 23, 2010 that would have otherwise caused the plan to lose its grandfathered status. 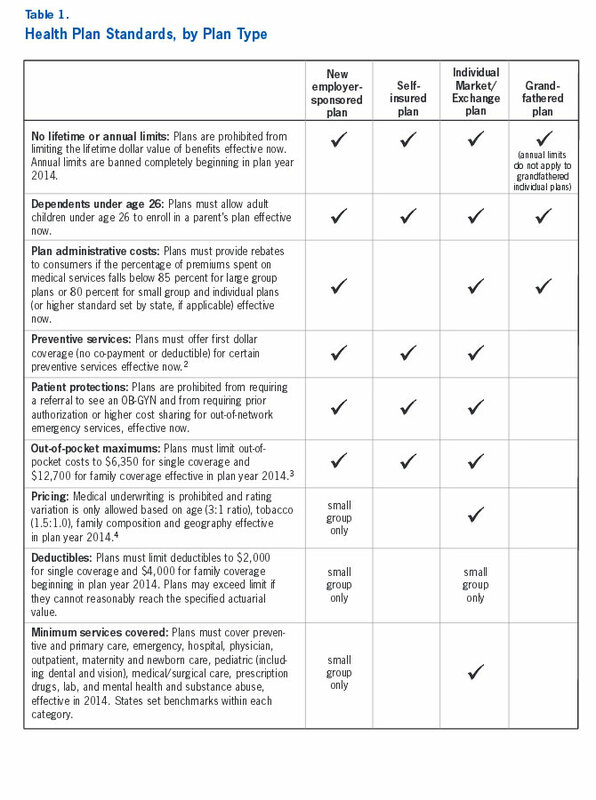 Self-insured plans are exempt from some of the plan requirements, as noted in Table 1. Insurers will be taxed at 40 percent of the aggregate value of plans above a high-cost threshold beginning in 2018. In the case of self-insured plans, the tax will be paid by plan administrators. The cost of this tax will likely be passed on to employers and enrollees through higher premiums. To avoid the tax, some employers and unions will want to make changes to their plans, such as changes in benefits, cost sharing or provider networks. The aggregate value of a plan includes the combined worker and employer contributions to premiums, in addition to employer contributions to a Health Savings Account, Health Reimbursement Account, Medical Savings Account or a Flexible Spending Arrangement. The value will be calculated excluding dental and vision benefits. Employers are responsible to pay any tax on the HSA or MSA amounts and to notify the insurer of the full cost of coverage. In 2018, the high-cost thresholds will be $10,200 for individual coverage and $27,500 for family coverage. The thresholds will be adjusted firm-specific age and gender and increased by $1,650/$3,450 for retirees aged 55 and over who are not Medicare-eligible, electrical and telecommunications installation/repair workers and individuals in high-risk jobs (including longshore work, emergency response, firefighting, law enforcement, construction, mining, agriculture, forestry and fishing). The thresholds may be adjusted upwards initially to the degree that Federal Employee Health Benefits Program premiums rise more than expected between 2010 and 2018 and will be indexed by inflation in 2020 and subsequent years (inflation plus 1 percent in 2019). Stand-alone Health Reimbursement Accounts (HRAs) will no longer be allowed in 2014, except for retiree-only HRAs. Contributions to a Flexible Spending Arrangement (FSA) for medical expenses are limited to $2,500. Funds from a HRA, FSA, Health Savings Account (HSA) or Medical Savings Account (MSA) cannot be used as reimbursement for over-the-counter medications not prescribed by a doctor. Distributions from a HSA or a MSA that are not used for qualified medical expenses will be taxed at an increased rate of 20 percent. The law eliminates the tax deduction for employers who subsidize Medicare Part D retiree drug payments effective in 2013. Tax credits are available for small businesses with 25 full-time equivalent employees or fewer and average wages of no more than $50,000 (in 2013), adjusted for cost of living in subsequent years. To be eligible, businesses must contribute at least 50 percent towards single coverage premiums. The credit pays up to 50 percent of employer contributions beginning in 2014. In the case of taxexempt small businesses, the credit pays up to 35 percent beginning in 2014. The credit varies based on employer size and average wage—employers receive the full credit if they have 10 FTEs or fewer and average wages of $25,000 or less, but the credit phases out as firm size and average wages increase. Beginning in 2014, the credit is only available for employers that purchase coverage through the exchanges and an employer can only receive the credit for two consecutive years once they begin offering coverage through the exchanges. The credit can be reflected in calculating estimated tax payments which can reduce employers’ tax liability right away. Beginning in plan year 2014, group health plans and issuers can provide rewards to employees of up to 50 percent of the total employee-only plan premium as part of a “health-contingent” wellness programs designed to prevent or reduce tobacco use, up from the current limit of 20 percent. The maximum reward is 30 percent of premiums for all other health-contingent wellness programs. Health-contingent wellness programs are those that require an individual to satisfy a standard related to a health factor to obtain a reward, whether the standard is participation in an activity like walking, diet, or exercise, or achievement of a health outcome. Under federal regulations, programs must meet additional standards, including but not limited to: allowing participants the opportunity to qualify for a reward at least once a year, being reasonably designed to promote health or prevent disease, making the reward available to all similarly-situated individuals, and offering a reasonable alternative standard for individuals with a medical condition that would make it difficult to satisfy the standard. Rewards may be in the form of a premium discount, reduced cost-sharing, the absence of a surcharge or other disincentive, or a benefit that would not otherwise be provided under the plan. Employers must report the value of the benefits on each employee’s annual Form W-2 beginning with the calendar year 2012 forms. Some employers are exempt from this requirement until the IRS issues further regulations. Exempt employers include but are not limited to: employers filing fewer than 250 W-2s in the prior calendar year, multiemployer plans, and employers offering HRAs or self-insured plans not subject to COBRA rules. Under the ACA, large employers are required to report information about health plans offered to fulltime employees in order for the IRS to administer the employer responsibility provisions and premium tax credits. Employers sponsoring self-insured health plans are also required to submit information regarding minimum essential coverage in order for the IRS to administer the minimum essential coverage requirement. Employers with self-insured plans which must file information on minimum essential coverage and employer-sponsored plans can use a single, consolidated form for reporting. These reporting requirements, summarized below, are effective beginning in 2016 for calendar year 2015. The IRS encourages voluntary reporting in 2015 for calendar year 2014. Entities must report to the IRS on or before February 28 following the relevant calendar year (March 31 if filed electronically). Entities must also provide statements to each responsible individual (Section 6055) or full-time employee (Section 6056) on or before January 31 following the relevant calendar year. Reporting entities: Insurers, plan sponsors of self-insured groups, government sponsored programs, and any other individuals that offer minimum essential coverage must report. Separate returns must be filed for each of the applicable large employer members of a controlled group that sponsors a self-insured health plan, but the members may assist each other in filing the returns. Statement to individuals: The reporting entity must also report certain information to the “responsible individual” (typically the primary insured or employee) including policy number, contact information for the reporting entity, and the information to be reported to the IRS. Reporting entities: Applicable large employers (defined on page 2) must report. This includes employers with between 50 and 99 employees, which are not subject to the employer responsibility provisions in 2015. Separate returns must be filed for related employers that are members of the same applicable large employer. Statement to employees: The information reported to the IRS with respect to each employee must also be reported to those employees, in addition to reporting the name, address and EIN of the applicable large employer member. Employers that provide a qualifying offer of coverage that costs the employee no more than 9.5 percent of the Federal Poverty Level (approximately $1,100 in annual premium costs in 2015) for self-only coverage, and offer coverage to the employee’s spouse and children, can provide a simplified report to the IRS and to the employee. For all other full-time employees, employers must follow the regular reporting rules. In 2015 only, an even simpler method of reporting to the IRS and to employees is available for employers that provide a qualifying offer to 95 percent of full-time employees and their spouses and children. Applicable large employers that provide a qualifying offer of affordable coverage with minimum value to at least 98 percent of employees on whom they are reporting (and their children) are not required to identify whether a particular employee is a full-time employee or report the total number of full-time employees. Congressional Budget Office, April 2014. Only certain preventive services are covered under this provision. Examples include mammograms, pap smears, colonoscopies, certain blood tests, CDC-recommended immunizations and well child office visits. See the list of covered preventive services: https://www.healthcare.gov/coverage/preventive-care-benefits/. to be coordinated between service providers. In states permitting large group plans in the exchange in 2017, these pricing standards will apply to all fully-insured large group plans in and out of the exchanges.